The most popular cryptocurrency, Bitcoin may not be completely out of the woods yet, a popular technical analyst warns traders. Although the sentiment surrounding bitcoin has been boosted by renewed hopes after a gain of almost 30% since the bottom in mid-December, a new triangle-shaped chart pattern may signal lower prices ahead, analyst Jesse Colombo at Clarity Financial, Houston-based registered investment advisor firm, wrote on Tuesday. 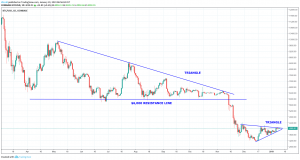 According to Colombo, bitcoin has just formed another triangle pattern, following the previous big triangle pattern that ended with a breakout to the downside on November 14 last year. The way Colombo sees it, the new chart set-up should be seen as a continuation pattern in the currency bearish trend. “For now, I am watching which way Bitcoin breaks out from the triangle that is currently forming,” he concluded. Meanwhile, Travis Kling, founder of the crypto hedge fund Ikigai, told Bloomberg that “it’s unlikely that the bottom is in for Bitcoin” as "the preponderance of evidence leads us to believe that we’ll see more lows before we head higher." Bloomberg also refers to GTI VERA Bands Indicator, a technical measure, which suggests that Bitcoin is on the brink of a large move. However, it’s direction is not clear yet. Also, on Tuesday, DoubleLine Capital CEO Jeffrey Gundlach said that a move to USD 5,000 for bitcoin is possible, CNBC reported. However, he did not specify when it may happen. “I don’t recommend anything with bitcoin, really… but if you really want to speculate, I think it could make it to USD 5,000. Talk about an easy 25%,” Gundlach was quoted as saying. As reported last week, data from a DailyFX research note showed that 80% of traders with a position in bitcoin are on the long side – meaning they have positioned themselves for higher prices. This is the highest level of optimism among bitcoin traders since November 2018. 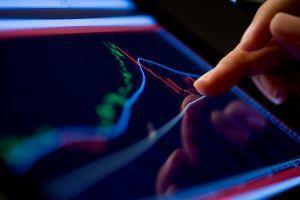 However, the danger is that these traders will be forced to sell if things do not turn out the way they expected. 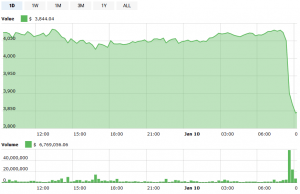 Today, bitcoin is down by more than 5% in the last 24 hours (UTC 07:26 AM.) The recent bearish moves in BTC/USD below USD 3,850 are signaling an increase in selling pressure. If sellers remain in action and the price drops below USD 3,720, bitcoin and many altcoins could extend slides in the coming sessions.